After tense discussions over two days in Vienna, an alliance of 24 global oil producers, known as OPEC+, this month struck a new agreement to curtail output in order to balance the market. The new agreement gives OPEC+ breathing space — but it certainly doesn’t mean the worse is over when it comes to oil prices. The coming few months may be more challenging than the first few months of the old agreement, which was struck in late 2016. Conditions have changed considerably since then. The OPEC+ alliance — made up of the Organization of the Petroleum Exporting Countries (OPEC) and independent producers including Russia — agreed to cut their collective production by 1.2 million barrels per day (bpd) starting in January. There are many moves in the political and economic scene — in addition to changes in market fundamentals — that mean this new agreement comes to light at a tough time. Unlike previously, OPEC+ did not disclose any math behind the new agreement — and the market is still unsure which producer-country will cut by how much. This is making it hard for the market to forecast individual compliance rates. Moreover, what made the previous agreement successful was not the agreement alone — but, rather, a number of factors that existed outside of it. That agreement itself would have never been as successful as it was were it not for the efforts of some producers to outperform others in terms of conformity to cuts. The US will be a big source of disruption to the OPEC+ deal going forward — not only politically, but also because production from its shale basins is expected to increase. Holding everything constant, the oil market was forecasted to rebalance late in 2018, based on OPEC’s own estimates. It was only due to the different external factors that the market rebalanced earlier that that, in the first half of the year. The involuntarily reduction in Venezuelan output, an increase in demand for oil from Asia, hurricanes in the US and supply disruptions in Canada, are just some of the factors that allowed OPEC+ to claim victory earlier than expected. It is highly unlikely that the outcome of the first deal will repeat itself in 2019 unless similar unexpected circumstances arise, or some of the big producers within OPEC+, such as Saudi Arabia, shoulder a greater share of the burden in cutting output. Political uncertainly is set to further complicate the implementation of the new cuts agreement. OPEC has faced attacks by some US politicians over output levels; there is ongoing pressure to pass a “NOPEC” bill against the producer group, which accuses it of being a cartel. In addition, when the first OPEC+ deal went into effect in January 2017, US President Donald Trump was just assuming office. Back then he had many other issues to deal with; this year Trump has tweeted many times about OPEC, moving the oil markets as a result. Other political factors to be considered today include US sanctions on Iran and the trade war with China, which is considered a major risk to oil demand. The US will be a big source of disruption to the OPEC+ deal going forward — not only politically, but also because production from its shale basins is expected to increase. The US is already the world’s largest oil producer, and recently claimed to be a net exporter of petroleum products. 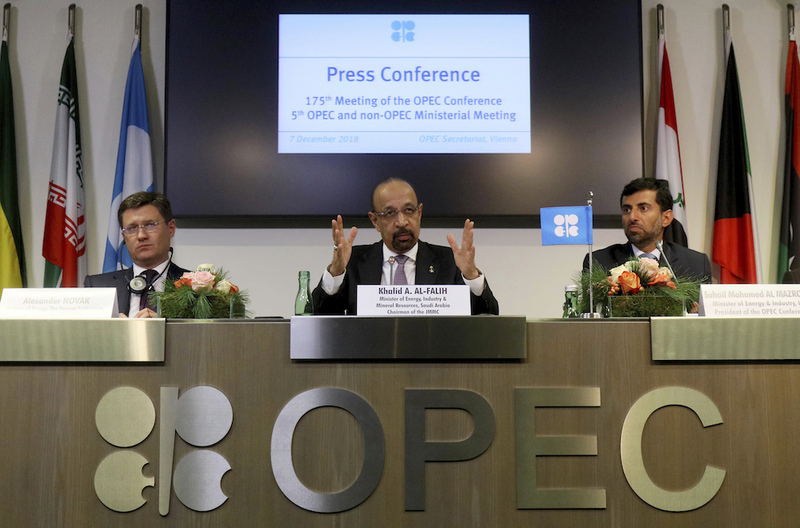 Faced with uncertainty over global oil demand and a upside risk for US and non-OPEC production, the likely success of the new OPEC+ cuts is hard to judge. Until more information comes to light, we will see volatility in a market that is already highly sensitive to headlines from North America and China.